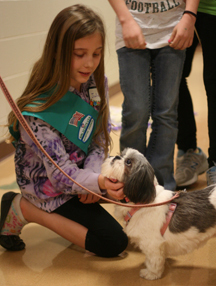 Scouts will take a behind-the-scenes tour of the Wisconsin Humane Society Ozaukee Campus, learn about and interact with an adoptable cat and make a cat toy to take home. They will also learn about dogs, animal safety and training through positive reinforcement while spending time in Pooch Palace. We can accommodate a total of up to 20 scouts and 5 chaperones per early scout night (multiple troops can attend). Register early as dates tend to fill quickly. If you have questions, please contact the Youth Programs Department at (262) 988-5947 or aswanson@wihumane.org.